1 Congratulation to your silver wedding. We wish the lucky couple that all your dreams and wishes come true until your golden wedding. 2 If love is a exiting dream the marriage is a chastening alarm clock. I wish you 2 all the best for the next 25 years. 3 Your love is like a circle � never ending. 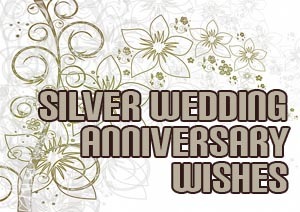 I am sending you all the best wishes for your silver wedding. 4 On your 25th wedding anniversary I wish you a fantastic party with your family and a great second wedding trip. 5 The silver wedding day is a nice occasion to look back on the fantastic moments of the last years and look at the dreams for the upcoming years. 7 On your silver wedding day i wish you the the upcoming years will be just as happy as the last 25 years. 8 For a successfull wedding he has got to keep his mouth shut and his wallet wide open. All the best for your silver wedding. 9 When god brought you together he has certainly shown his sense of humor . Congratulation to your silver wedding. 10 Every man sees a second mother in his wife and every woman sees her first child in her husband. All the best for your silver wedding day.